The August focus of Orion Gives Back is Camp Good Grief. Camp Good Grief is a 3-day camp for children who have lost family members from cancer, accidents, drug overdoses, suicides or murders. About 40 children ages 6 – 12 attend each year, free of charge. During camp, the professional bereavement staff helps them through support groups, therapy sessions, and activities. It’s a place where children can freely laugh, play, smile and take time to grieve. Angela Hamblen helped spearhead the development of the camp and continues as its Director. Here, she shares with us the impact of the work they do and her thanks for the support they receive. Orion: We would love for you to tell us a story that will help our readers understand the impact Camp Good Grief has. Could you share with us one of your most memorable experiences that would be an example of this? Ms. Hamblen: There are thousands of memorable stories from over the past 17 years. One that stands out to me is of a girl who came to us when she was 10 years old. She moved here after witnessing her father kill her mother and grandmother, and then himself. She came to Memphis to live with her family, but was in considerable trauma and needed help. She began with weekly therapy sessions at the Kemmons Wilson Family Center for Good Grief. We saw her for 7 months, then when summer rolled around she attended Camp Good Grief. The group she was in was a traumatic loss group – every child in the group had lost a parent by either murder or suicide. During the 3 days she spent at camp, she changed right before my eyes. The experience of seeing and hearing other kids who had been through something similar to what she had was transformative. She realized she was not alone, that she was not the only one who was carrying such a weight. When she attended therapy after camp, it was like she had taken 15 leaps forward. She is now 14 years old and about to enter high school. She has come back to be a volunteer at Camp Good Grief, something we would never have thought possible when we first met her. Her story illustrates the value our center provides – since we offer our services free of charge, we don’t have the restrictions that would be in place due to insurance. We were able to allow this girl the time she needed to heal, instead of confining her to a limited number of sessions. Orion: Tell us how you first got involved with Camp Good Grief. Ms. Hamblen: I started at Baptist Trinity Hospice as a Social Work Intern. Baptist was looking at starting a grief camp, and I had specialty camp experience. A group of us developed the first camp and then I was hired. I led the expansion into a teen specific grief camp, adult specific grief camp and then the Kemmons Wilson Family Center for Good Grief. Orion: What’s the best thing to happen since you started working with the Camp? Ms. Hamblen: I have seen children find hope again. It’s amazing to witness the change that can happen in 3 days…..children see that they are not alone; they learn that it’s not their fault their loved one died; they learn it’s ok to cry, to be happy, to laugh….they learn to grieve and live! And there’s nothing more incredible to witness than that. 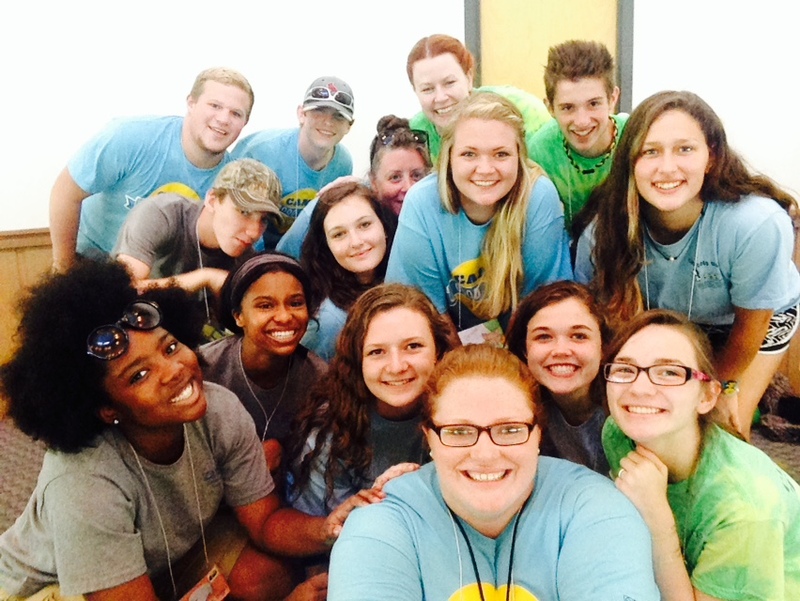 Camp Good Grief Director, Angela Hamblen, surrounded by former campers who are now teen volunteers. Orion: What do you wish other people knew about the Camp? Ms. Hamblen: I wish people understood that Camp Good Grief is one of the happiest most accepting places on earth! We do a lot of grief work, but it is balanced with lots of fun and laughs…. Orion: You have already made such a positive impact in our community. What would make it possible for you to do even more? Ms. Hamblen: We have a huge need to expand our current facility, we need to explore a satellite location and expand Camp Good Grief. All of our services are free of charge because there is no insurance reimbursement. Therefore fundraising is a huge need of ours. Orion: What would you tell someone who is thinking about donating or volunteering to your organization? Ms. Hamblen: I would say THANK YOU, because we need both!!!! Grief touches everyone and you never know when someone you love may need our services. Donations allow us to continue doing this work. Fundraising is our biggest need to keep these services available to our community. Camp Good Grief is part of the Kemmons Wilson Family Center for Good Grief. Their other programs include one-on-one counseling and support groups. Bereavement care is provided free of charge, including grief groups, individual counseling, and the Camp Good Grief programs. There is no time limit on the number of visits. For more information and to learn about ways you can help, please visit http://www.bmhgiving.org/cgg-about. Posted in August and tagged Angela Hamblen, Camp Good Grief, Orion Gives Back. Bookmark the permalink. What a GREAT Camp and cause, thanks for sharing!